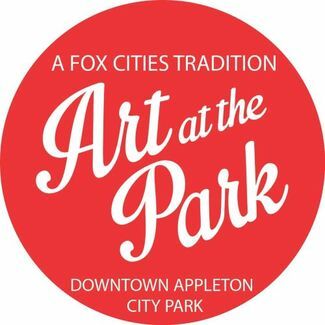 Each year, Art at the Park draws tens of thousands of visitors to this one-day event held in historic City Park in downtown Appleton, Wisconsin. Since 1960, Art at the Park has been a treasured community event that showcases the work of nearly 200 participating artists from throughout the country. Volunteer instructions will be sent to you prior to your volunteer shift. All volunteers receive a complimentary Art at the Park t-shirt! Help us load up the U-Haul with all of our Art at the Park supplies. Some heavy lifting needed. Assist with setting up tents, tables, chairs, signs, booth flags, garbage bins, recycling bins, and more! Quick job but requires precision! Work with a partner to accurately measure artist booth spaces and insert booth flags so artists know where their booth location is. Help sign-in volunteers and direct them to their scheduled locations. Greet artists, find their registration packets, show them their booth location on the map, answer questions, etc. You will be assigned one of the four streets that border the park. Traffic Supervisors will work with staff to ensure artists find their correct booth locations, they don't park in no-parking zones, they set-up their booth within assigned location, etc. Pick-up bags of ice from a local convenience store and bring to City Park. Fill the 3 or 4 coolers at the park with ice. Quick job but some heavy lifting required! The ice will be pre-purchased - we will let you know where to pick it up. Work near the beer/wine garden: check visitors' IDs to ensure they're over the age of 21 and give wristbands. Volunteers must be 21 or older. Monitor the beer/wine garden and walk the perimeter of the park - remind guests to finish their beverages before leaving the park grounds. Encourage guests to throw beverage cups in the correct bin (recycling vs. garbage). Handout event booklets, answer questions, greet guests with a smile, and remind guests that they need to finish their beverages before leaving the park grounds. Welcome visitors to the community art project and encourage them to participate! Work with the community engagement artist and help visitors participate in the collaborative art project. Help families sign their kids up for Trout Museum art classes and camps! The art classes won't take place at Art at the Park - you're simply helping sign kids up for future art classes at the Trout Museum of Art. Empty garbage bins, pick up garbage from the ground, maintain restrooms, keep picnic area tidy, etc. Quick and easy job! You might not be needed for the full timeframe. Provide artists with a short break - sit in artist's booth while they leave for a snack or restroom break. No sales are made during this time - you simply sit and watch their belongings! Looking for someone to volunteer their time and photography skills! A great way to gain some event photography experience! Quick job but requires precision! You will be assigned one of the four streets that borders the park. Deliver artist lunches to the correct booth. You will receive a list of artists that ordered lunch and you'll deliver their order to them. You'll be assigned tasks when you arrive. Tasks may include: tearing down stations, packing up supplies, folding and stacking tables and chairs, picking up trash on the ground, etc. Help us unload all of our Art at the Park supplies from the U-Haul.